Today’s topic is addressing the differences in healthy and unhealthy relationships. A healthy relationship is based on mutual respect, trust, partnership and support. It seeks to be fair when addressing any conflict and seriously takes the other person’s point of view into consideration. This usually plays out in a few key characteristics that are necessary. 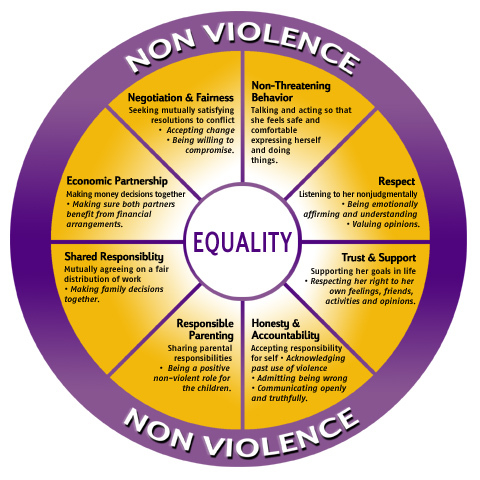 According to the Duluth Model’s Equality Wheel, a healthy relationship has 9 key elements: Non-Violence; Negotiation & Fairness; Non-Threatening Behavior; Respect; Trust & Support; Honesty & Accountability; Responsible Parenting; Shared Responsibility; and Economic Partnership. During counseling sessions with couples, one model used is the Gottman Model. It was developed by Drs. John and Julie Gottman. It uses the Sound Relationship House to address and maintain these elements of a healthy relationship. There are specific activities and skills practiced to address each level of the house. An unhealthy relationship usually presents as quite the opposite of the above examples. At least one partner is critical of the other, there is aggressive or passive-aggressive forms of communication or conflict management, there is an absence of mutual respect, there is very little compromise, and there is an absence of being able to accept responsibility for things that might need to change in the relationship. According to the Duluth Model’s Power and Control Wheel, an unhealthy relationship also can have 9 key elements: Violence (Physical and/or Sexual), Using Intimidation, Using Emotional Abuse, Using Isolation, Minimizing, Denying, Blaming; Using Children; Using Male Privilege (or the Dominant Partner Privilege); Using Economic Abuse; and Using Coercion & Threats. Counseling with qualified clinicians can effectively address both types of relationships. Healthy relationships with minor challenges or a goal of strengthening the current bond can utilize couples counseling to be proactive. This can help those relationships stay ahead of the statistics, which shows that most couples wait until 6 years after they have started having problems before seeking professional help. Use couples counseling as maintenance and Preventative Care vs. Emergency Room level attention. Couples with more serious issues can also benefit from couples counseling to retrain ineffective and harmful behaviors in their relationship. There is one caveat, relationships that have a partner who engages in “characterological violence" (one who frequently uses abusive tactics, especially physical violence, as a way of controlling and manipulating their partner) are usually less successful in couples therapy without individual counseling being utilized by the abuser. A decision might even need to be made by one or both people in this type of abusive relationship to separate or end the relationship. Disagreements will occur in any relationship. How you deal with those disagreements and with each other determines a healthy vs. unhealthy relationship. Counseling can help you navigate Conflict Management vs. Conflict Resolution. The Relationship Boosters is a group of Gottman approved educators and licensed counselors. Feel free to contact us if you are interested in couples counseling. You can also seek out other couples counselors in your area for further help. HelpGuide.org has great resources for people who are in abusive relationships. If further help is needed in that area, try their link in order to get resources where you live.